for all of her suffering children, our brothers and sisters. for our shepherds "to be worthy representatives of Jesus, leading us with love on the way of truth"
Hello and thank you all for being here with us today. I want to say a few things on behalf of my family, specifically my parents. Over 38 years ago, my parents were told that their new baby, Teresa, would have a very difficult and very brief life. Essentially, they were told to have no hopes or dreams for her to have any type of ordinary life. Yet here we are, 38 years later, in a church full of people who were touched by Teresa’s EXTRAORDINARY life! It was difficult for my parents to receive that news but what they didn’t know was that this child would be the love of their lives and actually effect so many other lives. They didn’t know that they were about to embark on a journey of miracles and love beyond measure and that this child, would leave a huge mark on this world. How did we get to 38 years? It was love, determination, many prayers and miracles…. the help of God himself and many, many selfless and loving people. My mom and dad want you all to know that they couldn’t have been the phenomenal parents that we all love and respect so deeply, if it were not for so many of you and they have an eternal appreciation and love for all who touched Teresa’s life. There were some very special doctors, nurses, office personnel, hospital staff, therapists and pharmacists from the medical community. My parents have a special appreciation and love for all of Teresa’s PCA’s that helped at home and are now a part of our family. We are indebted to and have a special place in our hearts for The Kennedy Donovan Center and all its personnel. It’s administration, drivers, aids, teachers and nurses who are Teresa’s family. We are so grateful for them. And there is a special appreciation for all the prayers of so many of you throughout the years. My parents know, that without all of these people, they wouldn’t have had all the miracles and strength that they had all these years. Teresa had a full life because of all these people and my parents will be eternally grateful. Teresa drew them all in without having to say a word. Teresa allowed us all to witness true unconditional love. Even if you didn’t get to know Teresa and you are here to support one of her family members, than you were touched by her life, because we were. My sister wasn’t lucky to have us, we were so very blessed to have had her. If you ever find yourself questioning God’s love, think about Teresa and be at peace. Don’t ask why God makes bad things happen, because he doesn’t and Teresa’s life is an example of how He makes all things good for those who truly trust Him. Jesus told us that the least among us is the one who is greatest and that of all things, the greatest is love. And Teresa was loved so much. St. Joseph's Church Del Rio TX. 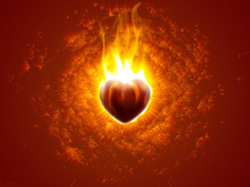 Before our celebration of our Third Anniversary of Little Handmaids of Our Sorrowful Mother at the end of June, 2013 the Lord promised me in prayer that a holy wildfire would spread. Those of us in Del Rio, Texas, USA, have been seeing and enjoying some of that wildfire. While we are still barely thirty little handmaids—spread throughout the USA, and with one in Bosnia, and one in Spain—those of us who are active here in Del Rio are excited about the fruit that the Holy Spirit is bearing through us. As I already stated, we celebrated our Third Anniversary at the end of June--for the first time publicly--at the KC Hall in our town. Fr. Antonio Moreno, our spiritual director, gave a talk on Christian Prayer: A Way to Compassion and Contemplation. There were about 65 women and men who attended the celebration, and we were blessed to receive three more little handmaids into our apostolate here in Del Rio. Everyone there was radiant with the joy of the Lord. On September 15, 2013, the feast of Our Lady of Sorrows, several of the little handmaids here made their Total Consecration to Jesus through Mary, according to the plan of St. Louis de Montfort—after preparing for 33 days to do so. There were at least four little handmaids in other towns who made their Consecration at the same time. Also, here in Del Rio there were several other persons who prepared and made their consecration at the same time that we did. During the preparation period, we purchased a set of three DVD discs, with six talks given by Fr. Hugh Gillespie, a Montfort Father, about the meaning of the Total Consecration. We showed them to some of the little handmaids and several other people, with an average of twenty people viewing them on each of three weekly evenings. It is an excellent series that gave all of us a deeper and clearer understanding, presented in a simple way, about the meaning of being consecrated to Jesus through Mary. Fr. Moreno celebrated a beautiful Mass for us, which was planned and participated in by several local Catholic groups besides the Little Handmaids of Our Sorrowful Mother: the Legion of Mary, the Guadalupanas, the Knights of Columbus, and a St. Padre Pio Rosary group—from our three local parishes. About twenty people, more than half of them from other groups, made their consecration on that day. After the Mass, we had a fellowship, with plenty of good food, and some gifts too, in the parish hall of St. Joseph Catholic Church here. After that Consecration Mass, some of the little handmaids began to feel led to encourage other groups and individuals to make the Total Consecration of Jesus through Mary by St. Louis de Montfort, and through our encouragement, a group of about thirteen Guadalupanas prepared for the 33 days and made their consecrations at the Mass in honor of Our Lady of Guadalupe on December 12, 2013. Also, after that Consecration Mass, it became apparent to us that there needed to be more of a sharing of responsibilities, so officers were chosen: Blanca Briones as administrative director; Rosie Aguilar as secretary; and Leticia Escobar as treasurer. Cami's vocation to be director of spiritual formation of the Little Handmaids of Our Sorrowful Mother is now more clearly defined. We believe that a central objective of our mission is to encourage others, and to help them by helping to provide resources for them, to make this powerful Consecration, which has been recommended by several Popes. We are beginning a process of discernment to seek the Lord’s light to know more clearly what our mission is, and the objectives of that mission. With the permission of our spiritual director, Fr. Moreno, and of the pastor of St. Joseph Church, Fr. Henry Clay Hunt III, we will soon be starting a class/discussion group on St. Louis de Montfort's book, True Devotion to Mary. This book is a primary source of St. Louis de Montfort's Total Consecration to Jesus through Mary. We will be inviting Catholics from all three parishes here in Del Rio to the class. Rosa Maria had a surgery on her arm, and while on surgery she had a vision of Jesus walking towards her and healing the sick. That night in prayer Rosa Maria asked Jesus the meaning of this vision and the following is the answer Jesus gave to her in prayer. " Dear daughter, you are always telling me in your prayer that you want me to walk thru here, just like I did when I lived on this earth, you tell me to come visit my children in Spirit because you need me, and you tell me that in this world there is hate, there is envy, there are people who are sick and there is evil. This kind of prayer touches my heart, but what you don't know is that I'm always here, no one can see me, but I am here, do you think I can be in heaven and not help here, that is not how it is. When you came in to the clinic, I went straight to you and I made myself visible to you so that you won't give up praying for others. Please continue to pray for others, I love all my children and I want to be with them. I only have Mercy for my children. Con todo mi amor, con todo mi corazón, con toda mi fe, con toda mi confianza, en ti mi DIOS y en todo que de ti proviene, hago este escrito, con el gran anhelo de llevar fe y un gran amor a nuestro CREADOR…….El día l2 día de nuestra Madre Santísima de Guadalupe, mi esposo y yo viajamos a San Antonio Tx. para asistir a la clínica Star Vascular ,para revisión de mi brazo donde me dializan por mi deficiencia renal que padezco y una vez que me preparan para la pequeña incisión, mientras estaba el Dr. Haciendo la cirugía yo como siempre Ofrecía a DIOS, todo lo que allí sucedía, por la salvación de las almas y como siempre decía ‘’todo por ti por tu amor y en reparación de mis pecados y los del mundo entero. ’’ Y por que te amo te amo demasiado y cuando sentía que el Dr. cortaba yo sentía la sangre caliente y solo decía Jesús te amo, pero quiero amarte más como Santa Teresita, víctima de amor por ti y continuaba, te amo mucho Jesús, te amo y en eso volví los ojos a las placas, donde se debería ver mi brazo y en ese momento lo que yo vi fue a Jesús, con su bata blanca su Pelo largo, caminando hacia mí, a un lado de ese lugar veía varias camas con enfermos casi me enderezaba para ver si los conocía, pero no ,pero veía muy bien sus rostros y el Dr. seguía trabajando en mi brazo y cociendo la pequeña incisión y en eso dijo el Dr. Señora Alfaro ya terminamos….Antes de salir le pregunte al Dr. Que es lo que se veía en las placas y él me dijo su brazo así es como sabemos que tiene, pero no tenía nada, solo abrimos y lo que hicimos es abrir la vena y yo le dije, pues yo no vi mi brazo, yo vi a Jesús y a unos enfermos, también se veían niños y el Dr. Me dijo, pues lo que vio, es un milagro. Espere que se llegara la noche. Para preguntarle a Jesús., en la vigilia que hago diario y así lo hice. Mi amado Jesús, que fue la visión que tuve, debo hacer algo, me quisiste decir algo?...... Hija es que tusSiempre me dices, pasa por aquí, como pasaste cuando vivías en la tierra, yo sé que puedes hacerlo en espíritu, es que se te necesita, hay mucho mal, muchos enfermos, mucha envidia, celo y maldad y me dijo Jesús que esta ORACION LLEGA a EL Y DIJO lo que tú no sabes, es que siempre Ando por aquí, no me ven pero allí estoy, tú crees que voy a estar en el cielo y no ayudarlos, no así no es…..cuando tu llegaste a la clínica yo aquí estaba y cuando te vi me fui contigo, pero me hice visible, para darte ánimo,[para que no te canses de pedir por todos, tienes muchos anos que lo haces y siempre te escucho….también siempre me dices que quieres hacer grandes cosas por mí pero que acabas haciendo nada, pues con ese nada que me ofreces yo hago maravillas, me dices que no te sientes digna, sino pecadora, eso es cierto, pero cuanto te esfuerzas por no serlo y has mejorado en grande y por eso me acerco a ti visible., tu dolor y sufrimiento me lo has ofrecido y yo lo tomo como un mejor regalo y te lo retribuyo con visiones mías que tienes en tus diarios de hace muchos años, y espero que un día los des a conocer. Tú me dices diario CASI COMO LETANIA,QUE ME AMAS Y YO el amor lo pago con amor,, yo te amo y tú lo sabes y me lo agradeces cada día….YA ME VISTE, AHORA ya sabes que ando por AQUÍ Sigue pidiéndolo pues ardo en deseos de estar con mis hijos, los amo y los amo mucho y para ellos solo tengo misericordia. I want to share something with you and the other Little Handmaids of Our Sorrowful Mother. Recently, while here in Malta I visited the church where I was baptized. I requested a certificate of my baptism and was glad to see that I was baptized two days after being born as I was told. The second name which he gave me instead? Maria Dolorosa....after Our Sorrowful Mother. What a nice surprise for me and how wonderful to find this out! It seems God chose me to be a Little Handmaid from day one. Am I not here who am your Mother? "...nothing should frighten or grieve you. Let not your heart be disturbed. Do not fear that sickness nor any other sickness or anguish. Am I not here who am your Mother? Are you not under my protection? Am I not your health? Are you not happily within my fold? After my husband and I separated in October of 1992, I was invited to an Evangelization at St. Joseph’s Church in November of 1992. I was assigned to a comunidad, and that started my spiritual journey. I would walk every morning to the grotto at St. Joseph at 6 in the morning and would pray the rosary. I could see Fr. Pena sitting on a chair by the altar praying before mass which would start at 6:30 a.m. I was first praying for my husband to return home, but after Fr. Pena sat with me one day at church he told me if every time I see you praying you are praying for your husband to return, you must stop. You must pray for your children. You cannot make someone love you. You must let go and pray for your children. You hold on to Jesus’ hand, and don’t let go, and take care of your children. My daughter’s journey was a very hard one, but clinging to a rosary as she labored, she gave birth to a beautiful baby girl which was such a beautiful blessing to us. She brought such joy into our lives. She brought sunshine into my darkness of divorce. My daughter and I had developed a new relationship through this trial. Now 21 years later my granddaughter has announced she is pregnant out of wedlock and through many tears of pain and rejection she has come home to St. Joseph Church. My daughter and I have taken my granddaughter before our Blessed Mother and have consecrated her baby to our Blessed Mother, knowing even though she has a hard journey ahead, her baby will be a blessing from God and it will bring sunshine and joy into her world of pain and rejection. I continue to pray the rosary. Praying the rosary to our Blessed Mother gives us the grace to persevere, to come out of the darkness into the light of Jesus Christ. Dearest Cami, here is my testimony on becoming a little handmaid. I am sorry, I could not write it in fewer words. A few years ago a friend encouraged me to study the devotion to Jesus through Mary by St. Louis Marie de Montfort. It took me another year to order and pick up two books, “True Devotion to the Blessed Virgin” and “Preparation for Total Consecration.” Though I had seen my mother’s devotion to the Virgin of Guadalupe and her dedication to the Rosary, I had only begun a few baby steps towards this understanding. The Rosary had been a source of peace for my heart, especially during difficult times: the year my son was in Iraq, when my daughter was told that she could never conceive, and when my mother began to show signs of Alzheimer’s. Often during the meditations on the Rosary’s mysteries I would wonder at Mary’s humility, her suffering at the Via Dolorosa, and how as a mother, she could understand our pain as we suffer for our own. In my involvement with the ACTS retreats at St. Joseph Church, we began to practice centering prayer, and as my focus word I had selected “handmaid, esclava”. I had come to love the first two of the Joyful Mysteries: the Annunciation and the Visitation. I marveled on Mary’s commitment upon saying, “I am the handmaid of the Lord. May it be done to me according to your word.” Luke 1:38 I especially loved the word in Spanish, which is “esclava,”- slave. Not only handmaid or servant, but slave! And in the Visitation, I love to meditate on Mary’s response to Elizabeth as Elizabeth begins to praise her. Mary said, “My soul proclaims the greatness of the Lord; my spirit rejoices in God my savior.” Luke 1:46 Mary only wanted to focus on God’s greatness and how her spirit was so full of joy. For a time now I have asked God to make me a better listener. What do you want from me, Lord? How do I better serve you? And these two scriptures consistently come to me in different situations, meetings, prayer exercises, etc. I retired from teaching in 2010, more than anything, to have more time to enjoy my mother before her illness progressed to the point she would not recognize me. That first year, my mom was still functioning fairly well and did not need constant care as she did two years later. Another thing I wanted to do as soon as I retired was to visit the Holy Land. We made the pilgrimage in January 2011. It was a life altering experience for me. At every holy site: the birthplace of Mary, her tomb, the Upper Room, the Garden of Gethsemane, the dungeon where Jesus was kept before his crucifixion, …so many significant places! The magnitude of walking into these places where perhaps I was placing my feet over Jesus and Mary’s footprints slowly began to steal into my heart, and I was so moved that I could not stop crying. We were instructed by our spiritual director, Fr. Clay Hunt, from the beginning of our pilgrimage, to ask God for His special messages for each one of us. Again I asked Him to help me become a better listener to His will. Almost immediately I began to hear bits and pieces of a song in my head, as we were touring from place to place. I dismissed it, at first, as unimportant, thinking I must have heard a song and it was just stuck in my head. But all afternoon and the next morning, this song, which I began to piece together little by little, would not leave me. I discovered that it was John Michael Talbot’s song “Holy Is His Name” whose first two verses are: “My soul proclaims the greatness of the Lord, and my spirit rejoices in God my Savior!” I was awestruck and uplifted that God was speaking to me in such a special way. As I pondered on this, it became evident that not only was God speaking to me, but also was using me to communicate this verse to two other women. Blanca Briones and Lety Amezcua were about to direct the next ACTS women’s retreat and had prayed for a clear message for the theme of the retreat. I was so excited that I called Blanca from Jerusalem to tell her about it, even though my husband and I had already agreed not to make any calls. A day or two later, imagine my joy as we visited the Annunciation Church and the Visitation Church. During our pilgrimage, I was in the middle of the 33 day preparation of Total Consecration. This only made everything so much more meaningful. I made my consecration on Feb. 2, 2011, the feast of the Presentation of our Lord, kneeling at the foot of Mary’s image of our church. As I mentioned before, I am taking little steps in filling my heart with love for our mother Mary. I totally leaned on her support and strength during my mom’s last year of life. Caring for her became increasingly difficult; finding help within the family and hiring women who could help around the clock proved to be frustrating. Those who are familiar with Alzheimer’s, know the sadness in watching a loved one slowly fade away, the change in personality, the loss of special memories. It involves mourning the loss of the loved one even before they are gone. I began to feel the physical strain, in addition to the emotional one. And I just did not have the energy to pray the rosary daily, as I had in the past. My husband encouraged me by saying that the care I was giving my mother was my rosary prayer. What better offering and prayer to God? My frustration began to show, and I felt bad in having my dad see it. I began to pray for God to make me a cheerful servant. What good was it if I was serving my mom with anger and frustration? I prayed that God would make me more like Mary, to serve with humility and a cheerful heart. The word “handmaid, esclava” came back to me again. With God’s help, I vowed to be better, to do the best I could, and with a smile. I called my prayer warriors to pray for me to be able to serve with a cheerful heart. One of the responses by text was in reference to being like Mary, the handmaid of the Lord. I quickly asked her if I had mentioned to her about how this word was special to me, and she answered no. Again I felt Jesus and Mary’s encouragement and strength. I feel certain that Mary has consistently covered my family and me with her miraculous mantle, and in studying her more and more, she has enriched my life, has taken me further on this spiritual journey. How beautiful to ponder and meditate on her humility and surrender to God! The day I was introduced to the group called the “Little Handmaids of Our Sorrowful Mother” I knew I had to join. I was not very familiar with the Rosary of the Seven Sorrows of Mary but have come to realize that like most women, we have lived a life full of sorrows. In joining our sorrows with Mary, we are able to carry on, and even to find joy amongst the suffering. A joy that only God can give, a joy that is attained more readily through our loving Mother, Mary. Just to testify to our Lord’s faithfulness and Mary’s care: My son returned safely from a year of war; my older daughter who was told it was impossible for her to conceive, is on her second pregnancy, I felt the presence of Jesus and Mary upon praying the chaplet of Devine Mercy at both my mom and dad’s deathbed. My middle child, who also had trouble conceiving, became pregnant but miscarried and after much prayer (Novenas to the Virgin of Guadalupe and the Infant Child Jesus) is now pregnant. Glory and praise to our Lord Jesus Christ! Thank you, Mother Mary for showing us the way to your Son. My name is Sharon Theil. I am a Catholic homeschooling mother of two boys living in Chapel Hill North Carolina. This past Sunday, September 16, on the Feast of Our Lady of Sorrows I made my Total Consecration to Jesus Through Mary. I had completed the 33 day preparation of St. Louis De Montfort on Friday, took confession on Saturday, and then made my Consecration at Holy Mass on Sunday. I would very much like to join the Little Handmaids of Our Sorrowful Mother. I can't tell you how exciting your email was to me! For the first time this year, the Little Handmaids made their Total Consecration together, and we celebrated our Consecration at a beautiful Mass of Consecration that our spiritual director, Fr. Antonio Moreno, celebrated for us... In the past, we had made our consecrations individually. How awesome that you were making your Consecration in Chapel Hill on the same day that we were making/renewing our consecrations here in Del Rio, all gathered in God's arms! Your email reminded me yet again that "the best-laid plans"...are really God's plans. I am so happy to know that you want to join the Little Handmaids. I will be sending you some documents in my next email to you. Thanks be to God, through the intercession of Our Sorrowful Mother! Cami, I'm in awe! I had made my consecration on the Feast of Our Lady of Sorrows and then I felt at loose ends...like, now what? And I was scared. Really scared. I won't go into detail but, I could hardly bring myself to say my Rosary and I belong to the Rosary Confraternity! I feel blessed! I feel humbled that Our Blessed Mother would care enough...to direct me to the on-line apostolate of the Little Handmaids of Our Sorrowful Mother. And it turns out that I made my Consecration to Jesus through Mary on the same day that, for the first time ever, the Little Handmaids made their Total Consecration together, and celebrated at a beautiful Mass of Consecration ! What Grace! We really must thank Jesus for giving us such a Mother! I'm so happy that you decided to become a little handmaid! About your fear, I want you to know that there were some who made their Total Consecration here in Del Rio who experienced some strong spiritual attacks during the period of preparation... That is a sign of the spiritual importance and power of the Total Consecration. The enemy wants to stop us from giving ourselves so completely to Jesus through Mary. Dear Cami, I am sorry I haven't emailed you sooner. I have 3 boys so it is hard to find time to sit down and calmly write. I live in Long Island, NY. I am 39, and blessed with a wonderful husband and 3 wonderful boys. I am Catholic, and have been raised fairly religious, but my spirituality has grown a lot in the last few years. I have developed a devotion to Our Lady of Kibeho and the Seven Sorrows over the last 2 years. Immaculee Ilibagiza had a retreat in New York. I went to it, and she talked about Our Lady of Kibeho and we prayed the Seven Sorrows. I have since gone to 2 more of her retreats in NY, each time bringing someone I felt would need it. I have to say, that it was really a life changing experience in a spiritual way. I have always loved the Blessed Mother,have said the Rosary all my life, but always felt a little intimidated. I know that may sound strange. After hearing Immaculee speak, she gave me a real mother through Our Lady of Kibeho. (I lost my mother to cancer several years ago.) It was an amazing experience, and praying the Seven Sorrows and meditating on her suffering has made me realize how human she was going through what she went through. I realize how much she loves us. I knew she loved me, but now I know it in my heart. I love the Kibeho meditations, I feel as if Our Lady is talking directly, telling of what happened. I have a Rosary group, and when we pray at my house, we always do the Seven Sorrows. We do the regular Rosary at everyone else's. Anyway, I have been trying to spread the Seven Sorrows Rosary, as best I can. I am excited about coming across your website. Making a commitment is a good thing, because when I feel lazy and don't want to pray, I know I have commited to the Little Handmaids to do better. I was wondering, did you write the Beloved, or was that another member? It was so beautiful, I cried and couldn't stop thinking of it. My cousin has 4 children, she homeschools, she is very religious. One of her children is severely retarded. I sent her the link to the page and it touched her deeply. Anyway, if it is ok, I would like to join. Maria Dolores Alvarez is the first Little Handmaid from Spain. In her beautiful testimony she shares that she had forgotten our Lord for years and years of her life, and then He drew her close to His Mother. First of all, she began to experience a strong attraction to the Rosary and to pray it fervently. Her praying of the Rosary drew her closer to our Blessed Mother. In May of this year she was blessed to go on her first pilgrimage--to Lourdes, France. In Lourdes she was able to bathe in the miraculous waters of the spring there. While in the spring she prayed: "Mother, wash me," and after bathing in the waters, she felt herself more deeply than ever to be the daughter of Mary. This past summer she was blessed to make a trip with her family to Rome and to attend a Mass celebrated by the Holy Father at Castel Gandolfo, where she was able to greet him afterwards as he passed. This is a brief summary of what she wrote (below) in Spanish. Ante todo quiero agradecer a la Providencia el haberles puesto en mi camino y a ustedes el aceptarme. Realmente es maravilloso descubrir la mano de Dios en nuestras vidas y la forma, sutil o radical, en que El va perfilando nuestro camino de conversión. En mi caso particular yo tuve a Nuestra Señora absolutamente olvidada durante años y años en mi vida. El Señor, de forma delicada me fue acercando a Su Madre. Todo comenzó con una especie de atracción, que jamás había tenido antes, hacia el Santo Rosario. Sentía en mi una fuerte llamada para rezar el Rosario, una necesidad de tenerlo entre mis manos, una fascinación nueva e intensa hacia esta oración. Comencé a rezarlo y desde el principio supe que mi amado Jesús quería esta oración para mi y no podía ser más que para que me acercara a Su Madre. El pasado mes de mayo nuestra parroquia organizó una peregrinación a Lourdes y nos unimos. Esta era la primera peregrinación de mi vida y no fue casual en absoluto que se organizara precisamente a Lourdes. Aquel viaje supuso el descubrimiento definitivo de la Santísima Virgen como mi Madre, amiga y aliada. Por gracia de Dios tuve la posibilidad de poder bañarme en las piscinas de agua bendita del manantial de Lourdes. Recuerdo que hacía mucho frio mientras esperábamos a que abrieran. Era muy temprano y yo solo podía llorar, con el Rosario en las manos, repetía "Madre, lavame"
Tras una larga espera entramos. Me desnudé, nerviosa, recitaba en voz baja un avemaria tras otro, lloraba. Cuando llegó mi turno una de las voluntarias que asisten en los baños me dijo que presentara mis intenciones a la Virgen. Le pedí por todos los que sufren a mi alrededor, a veces sin que yo me de cuenta. Le pedí de forma muy especial por la conversión de mi marido, para que su corazón se abra al Señor y encuentre su camino de fe, para que algún día podamos comparecer ante el Señor y que nuestro matrimonio sea bendecido, puesto que solo estamos casados civilmente a día de hoy, no ante Dios. Me sumergí en el agua, y rogué a la Madre. Al salir definitivamente me sentí hija de María. Comencé a sentir la presencia de la Virgen en mi vida y a profundizar en el rezo del Santo Rosario, de forma constante, hallando una paz, compañía y consuelo indescriptibles. Entonces un día, buscaba información sobre la Madre Dolorosa y descubrí la existencia del Rosario de los siete Dolores. Me fascinó porque verdaderamente pocas veces había pensado en el sufrimiento y dolor que nuestra Madre pasó en su vida terrenal. Por entonces alguien me dijo " no es casual que te llames así". Comprendí que la Madre de Dolores me estaba llamando. Desde entonces rezo el Santo Rosario, el Rosario de los Dolores y la corona de la Divina Misericordia cada día. Procuro también rezar el ángelus. Mi relación con la Madre crece en amor, unión y belleza y es en este contexto que nuestra Madre ha querido que yo las encuentre a ustedes. Ella no ha dejado de cuidarme y regalarme bellas experiencias en todo este tiempo desde que Su Hijo me llevó a Ella. Un bello regalo fue este verano. Viajamos a Roma y por gracia de Dios supimos que Su Santidad iba a oficiar Misa en Castelgandolfo el día de la Asunción. Mi esposo, no creyente, en un bello gesto de amor y generosidad, quiso que fuéramos a verle pues sabia la ilusión que nos haría tanto a mi cómo a nuestros niños. Pues bien, quiso la Madre que no sólo pudiéramos escuchar Misa oficiada por el Santo Padre, sino que después tuvimos la dicha de poderle saludar cuando se dirigió de visita a una Iglesia cercana. Les adjunto la fotografía que pudimos solicitar a L'Osservatore Romano en la que se ve al Santo Padre saludando a nuestros niños, y a mí misma detrás de ellos. Sirva esta foto como presentación al resto de pequeñas siervas de esta humilde sierva de la Madre dolorosa. En próximos días les iré contando algunas bellas experiencias que el Señor y la Santísima Virgen de los Dolores han tenido a bien regalarme en los últimos tiempos. Les envío un saludo afectuoso y mi bendición. Que la Madre de Dolores las proteja y guarde a todas.